While watching the Rose Bowl this weekend, I couldn't help but notice the stellar play of TCU Linebacker Tank Carder. He was everywhere on the field and seemed to always be coming up with one big play after another. 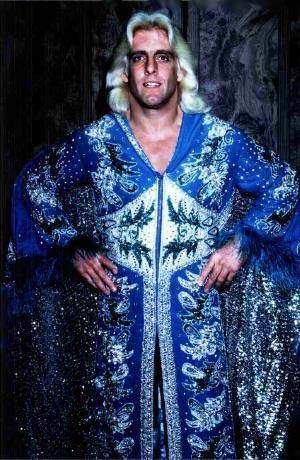 Carder was also easily recognizable because of his flair. I'm not talking about Ric Flair, I'm talking about armband flair, and Tank has a lot of it. 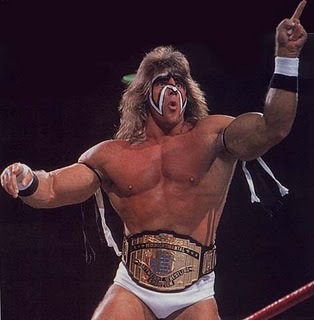 His bands stand out so much that it got me thinking about who else but The Ultimate Warrior. Could these two be related? Maybe Tank is a son or a nephew of the legendary wrestler? After a quick peek at the Warrior's wikipedia page it's pretty clear that The Ultimate Warrior, born James Brian Hellwig, is not related to Tank Carder despite their uncanny armband similarity. However, it's pretty clear that the former extreme athlete (Carder used to be a champion BMX racer) finds some inspiration in The Warrior. Carder is draft eligible this year but would have to declare early as he is a redshirt Junior. Although it doesn't look like he would be the top LB in this years draft, he could certainly be picked in the first few rounds. Carder has been the leader of the top defense in the country over the last two seasons and his stellar play in Saturday's Rose Bowl will absolutely help his stock. Maybe we'll get to see football's ultimate warrior playing on Sunday's next year. [url=http://www.iystwowgold.com#wowgold]wow gold[/url], Ok the games gold at my school i begged my parent to obtain me some plus they finally did! They may be so manner and awesome! they can be so nice. Simply put i absolutley Appreciate a lot of these games gold! The pair were the first of all match and even though individuals extremely distressed I just continually similar to giving these individuals. They're very confertable, sweet, eye-catching as well as well-crafted. Even if We somewhat smashed up mine it truly is cuz I really was wearing these people sooooo a lot of. Simply put i appeared obtaining one other binocular however. You can convey it throughout particular climatic conditions, flying, running oout by using pals. ect.. I must say i recomend this product in every case!!!!! That i cherished a games gold a whole lot I got myself all of the Claudette, not to mention fantastic as well!!! My wife and i special lots of games gold and thus would probably endorse the criminals to pretty much all. They are remarkably amazing, cool although excellent the foot type over all categories of disgusting, memorable climate that marilyn and i experience with upstate Chicago, most definitely the following the winter season. I saw it the main charcoal switch [url=http://www.gw2golds.de#gw2gold]gw2 gold[/url] as well as have right away more a grey control your to be able to great cupboard.